The role of the American sniper in late 20th century domestic politics is attested by the shooting deaths of President John F. Kennedy, Senator Robert F. Kennedy and Civil Rights leader Martin Luther King, Jr. More recently, the 2015 San Bernardino mass shooting that preceded the Oregon occupation was colored by the presence of Craft mercenaries as outlined in a two-part NewsInsideOut.com report (Part I, Part II) that linked this event to the 2013 Boston Bombing. That Ammon Bundy is currently under arrest facing trail does not exonerate him from suspicion in the same way that heiress Patty Hearst was shown to be a CIA NOC domestic operative during the SLA terrorism incidents of the 1970s who was subsequently tried and received a Presidential pardon. More information concerning the Oregon standoff protestor’s status is certain to emerge with the fullness of time. The presence of previously unreported forensic information concerning secret premonitions in Oregon protester Shawna Cox’s in-vehicle video was detected while monitoring mirror-filtered renderings of the occupant’s statements. The video soundtrack was loaded in the edit bay of a digital audio workstation then subjected to mirror-filtering and time-expansion in preparation for a detailed auditory study. The conduct of this procedure was informed by best practices refined through repeatedly providing military, forensic and medical-grade intelligence that had been successfully vetted through practical real-world feedback over nearly 20 years of unmatched research and reporting. NewsInsideOut.com coverage has described how the same procedure publicly revealed details of the Iraq War, identified the BTK Killer, named Russian spy Anna Chapman’s accomplice and uncovered the UFOs and ETs in Edward Snowden’s NSA cache weeks, months and years before such information became widely-accepted public knowledge. Below is a partial transcript of besieged protestors’ statements from January 26, 2016, preceded by the pre-incident and post-incident secret messages encrypted backwards therein. Vancouver, BC – Exclusive new video published to YouTube on December 8, 2015, purports to reveal how San Bernardino police officers responding to reports of a mass shooting involuntarily disclosed the role of secret government mercenaries in both the tragic events of last week and the 2013 Boston Marathon bombing. Testimony from one of two independent witnesses who identified three white male suspects in military fatigues at the Inland Regional Center was earlier shown to have invoked the spectre of “American Sniper” Chris Kyle at the scene. The Dallas Morning News reported in 2013 how the widow of “American Sniper” Chris Kyle, Tanya Kyle, filed a lawsuit against private military contractor Craft International, LLC (the company founded by her deceased husband), including a statement requesting to “stop using the skull-and-crosshairs logo designed by Chris Kyle.” NewsInsideOut.com’s previous report identifying a sniper at the scene characterized by the presence of drugs and a skull echoed the facts of an earlier study in which it been determined that the “American Sniper” was addicted to heroin, a substance known for its use in CIA MKULTRA programs. 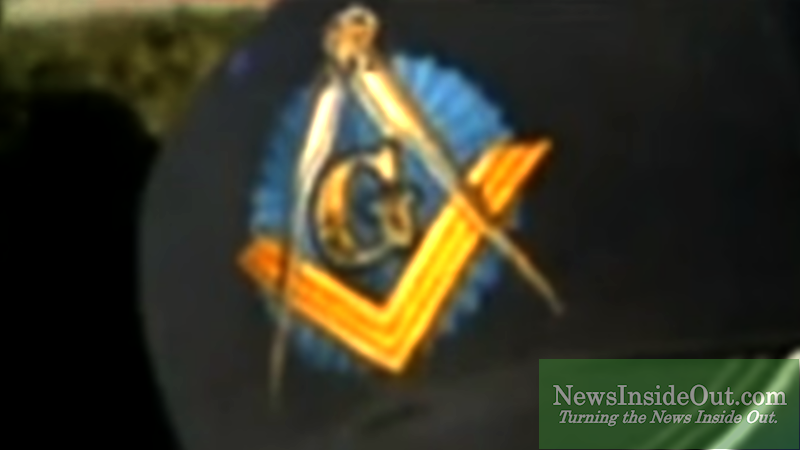 Masonic headdress featured in mainstream media San Bernardino mass shooting interview. Two men dressed in Craft International military fatigues and logo apparel carrying black backpacks were said to have been photographed at the 2013 Boston Marathon bombing. New analysis of the police dispatch audio released by San Bernardino police has detected statements in which persons known to police are cited for “throwing” the mass shooting, comparable to a “Job in Boston.” Seen through a mirror the skull-wearing drug-addled sniper cited in the sleep talking-like statements of witness Sally Abdelmageed becomes like a black skull-cap bearing Craft private contractor mercenary, akin to a member of a team whose duties straddle participating in domestic secret state-sponsored terror from sea to shining sea (or so it would seem). The presence of previously undiscovered forensic information was detected while monitoring mirror-filtered renderings of the officers’ statements. The police dispatch soundtrack was loaded in the edit bay of a digital audio workstation then subjected to mirror-filtering and time-expansion in preparation for a detailed auditory study. The conduct of this procedure was informed by best practices refined through repeatedly providing military, forensic and medical-grade intelligence that had been successfully vetted through practical real-world feedback over nearly 20 years of research and reporting. NewsInsideOut.com has previously reported how the same procedure publicly revealed details of the Iraq War, identified the BTK Killer, named Russian spy Anna Chapman’s accomplice and uncovered the UFOs and ETs in Edward Snowden’s NSA cache weeks, months and years before such information became widely-accepted public knowledge. Below is a partial transcript of San Bernardino police dispatch during their response to reports of a mass shooting on December 2, 2015, followed by the secret messages encrypted backwards therein. OFFICER(S): 1029 I think they might need (?) on that other pursuit. They do. Otter 12 are you still on my air? SECRET MESSAGE (Voice One): We did that. (Voice Two): We sure did. OFFICER(S): San Bernardino and Richardson. Copy. At San Bernardino and Richardson. SECRET MESSAGE: The system running government. OFFICER(S): On San Bernardino and Mountainview. Do not go westbound. Shut it down. SECRET MESSAGE: You’re a Mason. OFFICER(S): And north too to those teams going eastbound south of us, try not to go south where that car is. Just come back east. SECRET MESSAGE: Know people who’s throwing this. Job in Boston.